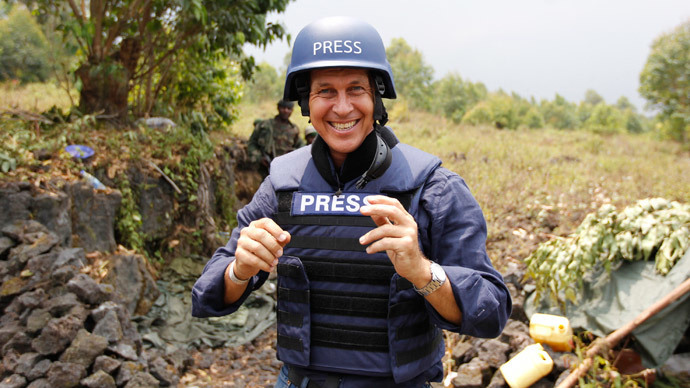 Al Jazeera journalist Peter Greste has been released from an Egyptian prison after serving 400 days in jail on charges of aiding a terrorist group. He is now on his way home to Australian, Egyptian security officials said as cited by Reuters. "There is a presidential decision to deport Peter Greste to Australia," an unnamed Egyptian official told AFP. Another official told AP that Greste’s release had been coordinated with the Australian embassy in Cairo. Greste was sentenced to 7 years in prison in June last year for allegedly supporting the banned Muslim Brotherhood movement. The four Egyptian officials who talked to Reuters didn’t specify the reason for the early release of the Australian journalist. They also didn’t share any information on the fate of the two other Al Jazeera employees, Baher Mohamed and Mohammed Fahmy, who were also jailed in the same case for 10 and 7 years, respectively. The Egyptian Interior Ministry confirmed on its Facebook page that Greste was released under the November decree, which authorizes the president to approve the deportation of foreign prisoners. Greste, Fahmy and Mohamedwere arrested in December 2013 in a raid on the Cairo hotel room they were using as an office, as part of a crackdown on Islamist supporters of President Mohamed Morsi. The journalists were accused of supporting Morsi's Muslim Brotherhood, which state officials have declared aterrorist organization, andfabricating “lies” to give the impression the country was facing civil war. On January 1, an appeal hearing in a Cairo court saw the case of the three journalists sent for retrial, shattering the hopes of the families to see their relatives released on bail. Fahmy’s fiancé, Marwa Omara, told Reuters that she was "hopeful” that he will also be soon released and deported from Egypt, like Greste. "His deportation is in its final stages. We are hopeful," Omara said. According to another security official, Fahmy is expected to be released from Cairo's Tora prison within days. The Canadian Foreign Ministry, which welcomed Greste’s release, said that it remains “very hopeful that Mr. Fahmy's will be resolved shortly." The door for Greste’s deportation was opened by a decree, which was signed by president Abdel Fattah el-Sisi in November last year. It granted the president the opportunity to allow foreign nationals accused of crimes in Egypt to serve sentences in their home countries. "The last thing we've heard is that the deportation for Peter Greste is complete. We've heard that Mohamed is either complete or in progress,”Assem Mohamed – the brother of third imprisoned journalist, Baher Mohamed – told Reuters. He also stressed that there is “no news on Baher” coming from Egyptian security officials. The release of Baher Mohamed is questionable under the presidential decree on the deportation of foreigners, as he is an Egyptian citizen and has no foreign passport. Though his colleagues received seven year prison terms, Mohamed was given an extra three years for possessing a single bullet when he was arrested – totaling a 10 year sentence. Mohammed Fahmy was working as acting bureau chief of Al Jazeera, which employed Australian correspondent Peter Greste and Egyptian producer Baher Mohamed. Following the sentence, United Nations human rights chief Navi Pillay urged the reporters to be released. She also accused Egypt of "crushing" the media. Australia and the UK slammed the verdict by the Cairo court as “appalling,” while Al Jazeera said that "not a shred of evidence was found to support the extraordinary and false charge” against its employees. “We’re pleased for Peter and his family that they are to be reunited. It has been an incredible and unjustifiable ordeal for them, and they have coped with incredible dignity. Peter’s integrity is not just intact, but has been further enhanced by the fortitude and sacrifice he has shown for his profession of informing the public,” Mostefa Souag, acting director general of Al Jazeera, said in a statement after Greste's release. Souag said that Al Jazeera “won’t rest” until Fahmy and Mohamed regain their freedom as well. “The Egyptian authorities have it in their power to finish this properly today, and that is exactly what they must do," he said.